Mercedes-Benz has revealed the new E-Class Coupe ahead of its official UK launch in Spring 2017. 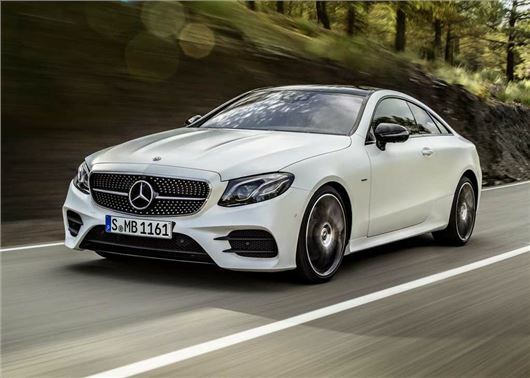 Inspired by the S-Class, the sleek new coupe will be larger and more luxurious than its predecessor, while autonomous driving aids and new engines will also make it cheaper to run and easier to drive. ﻿There are no details on pricing yet, but the Mercedes-Benz E-Class Coupe will go head-to-head with the BMW 6 Series. The sleek design features a sweeping roofline, with LED lighting and pillarless door frames. The body actually stretches 4826mm in length, and 1786mm in height, making it considerable larger than its predecessor. The messy cabin layout of the previous version has been replaced with a minimalist dashboard design, flanked by air vents that are influenced by the shape of airplane turbine engines. The interior can be customised with two high-resolution 12.3-inch screens, which merge to provide a widescreen view of the instrument and infotainment displays. Entry-level models get digital-effect instrument binnacles too, with the round dials separated by a seven-inch colour display, while a 8.4-inch infotainment screen dominates the dash. Like the head and tail lights, the interior is clad in LEDs, providing a choice of 64 ambient colours. At launch, there will be an initial choice of one diesel and three petrol engines, with outputs ranging from 184PS to 333PS. The E220d gets a four-cylinder 2.0-litre diesel, with 184PS, and an claimed 71mpg. The range-topping E400, with a 3.0-litre V6, produces 333PS and will provide an official 35mpg. The 0-62mph sprint will take just 5.3 seconds. The E200 is the least powerful engine in the range, with 184PS and a claimed 47mpg. The E300 provides 245PS and will return 44mpg. Both units are 2.0-litres. The suspension sits 15mm lower than the E-Class saloon, but Mercedes-Benz are adamant it has been tuned for comfort, with amplitude-dependent damping. Multi-chamber air suspension will be available as an option and feature automatic electronic damping that will adjust the car's ride to match the driving style. The latest autonomous driving tech will be available, including an innovative cruise control system that will automatically follow the vehicle in front and maintain a safe distance. Remote Parking Pilot will allow the E-Class Coupe to be moved in and out of garages or parking spaces remotely, via a smartphone app, enabling the occupants to get into and out of the car easily, even where space is very tight.